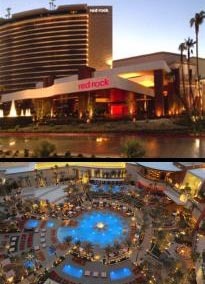 Red Rock Resort Spa and Casino is a resort spa and casino owned by Station Casinos on 70 acres (28 ha) located in the Summerlin village. Red Rock is located far off of the Las Vegas Strip; it is known as a locals casino. Located on Charleston Boulevard at the interchange of Clark County 215. The resort is the flagship property of Station Casinos, and the company’s corporate headquarters is located on property. Casino: Yes, a 87,000-square-foot casino. 60 gaming tables offering blackjack, roulette, craps, 2,700 slot and video poker machines, a 15-table poker room and 600-seat bingo room. Race & Sports Book: Yes. Restaurants: Red Rock Casino, Resort & Spa has the following dining options: Grand Café, Feast Buffet, The Bagel Cafe, T-Bones Chophouse & Lounge, Terra Rossa Italian Restaurant, Hachi, LBS: A Burger Joint, Cabo Cantina, Yard House, a food court and the seasonal Sandbar Poolside Café. Entertainment: Entertainment includes concerts at the Sand Bar outdoor venue, Dr. Zhivegas in Rocks Lounge and a 16-screen movie theater. Nightlife: Onyx Bar and Lucky Bar. Attractions: Yes, Red Rock Lanes, a 72-lane bowling center. Pool: Yes, a 3-acre complex featuring private poolside cabanas, 2 poolside bars, a poolside cafe and the adult-only Cabana Club. Spa: The Spa at Red Rock offers treatments from around the world in twenty serene treatment rooms. Indoor/outdoor couples suites are available. The spa also has a full service salon, state-of-the-art fitness area, movement studio, boxing ring, and spa lap pool with 3 outdoor cabanas. Convention Rooms: Yes, 70,000 square feet of meeting space. Room Service: Yes, restrictions apply. There is a refundable deposit and a non-refundable daily fee. In-Room Internet Access: The resort offers in-room high-speed and wireless internet access. Hotel Amenities: Concierge, currency exchange, laundry and luggage services, maid service, room service, wake-up calls and safety deposit boxes. Shuttle Service to the airport: Yes. The resort offers guests a complimentary shuttle to and from the airport. The airport shuttle picks up and drops off outside of baggage claim. Contact Red Rock Casino, Resort & Spa for the shuttle’s exact drop-off and pick-up times. Shuttle Service to the Strip: Yes. The resort offers guests a complimentary shuttle to and from the Las Vegas Strip. Contact Red Rock Casino, Resort & Spa for the shuttle’s exact drop-off and pick-up times. Standard Room Amenities: Luxurious Frette linens, plush robes and slippers, designer in-room toiletries, two plasma TVs, voice over IP internet phones, iPod docking stations, high speed internet/wireless internet, functional work desk, CD player, AM/FM radio, alarm clock, hair dryer, iron, ironing board, newspaper delivered daily, twice daily housekeeping, nightly turndown service. Policies: Children 11 and under stay free with an adult. The maximum total number of guests (adults and children) in a room is four. Red Rock Resort does not permit any bulk beverage or beverage containers on property. Incidental Charges: The Red Rock Casino, Resort & Spa charges a $24.99 per room, per night resort fee, which covers the cost of wired and wireless high-speed in-room internet, unlimited local and 800 calls, fitness center access, daily local newspaper, shoe shine service and airport shuttle service. Hotel requires a credit card for incidental charges. The resort fee listed above does not include tax. Some resorts also apply room tax to their resort fee.